This ground-breaking book addresses transformations in the understanding of time and the generation and degeneration of value at the cutting edge of modernity and postmodernity. Scott Lash, Andrew Quick and Richard Roberts are all members of The Institute for Cultural Research at the University of Lancaster. Introduction: Scott Lash, Andrew Quick and Richard Roberts (Lancaster University, UK). 1. Values in the Timescapes of Nature: Barbara Adam (University of Wales, Cardiff, UK). 2. Angels in the Archive: Lines into the Future in the Work of Jacques Derrida and Miché Serres: Roy Boyne (University College Stockton/University of Durham, UK). 3. Time and Neutrality: Media of Modernity in a Postmodern World: Elizabeth Ermarth (University of Edinburgh, UK). 4. The Time of the Real When Disease is 'Actual': Monica Greco (Goldsmith's College, UK). 5. Times of Value, Deconstruction and Value: Elizabeth Grosz (Monash University, Australia). 6. Being After Time: Towards a Politics of Melancholy: Scott Lash (Lancaster University, UK). 7. Catastrophic Times: Alphonso Lingis (Penn State University, USA). 8. Moving at the Speed of Life: Tim Luke (Virginia Polytechnic University, USA). 9. Le Presentisme ou la Valeur du Cycle: Michel Maffesoli (Sorbonne, France). 10. 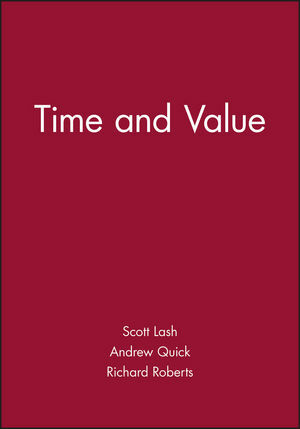 Time and the Event: Andrew Quick (Lancaster University, UK). 11. Fugit Hora: High Fashion, Television and the Ethics of Style: Hilary Radner (University of Notre Dame, USA). 12. Time, Virtuality and the Goddess: Richard Roberts (University of Lancaster, UK). 13. Time, Baroque Codes and Canonization: Bonaventura de Souza Santos (University of Quimbra, Portugal). 14. Staging the Self by Performing the Other: Global Fantasies and the Migration of the Projective Imagination: Luiz Soares (University of Rio de Janeiro, Brazil).